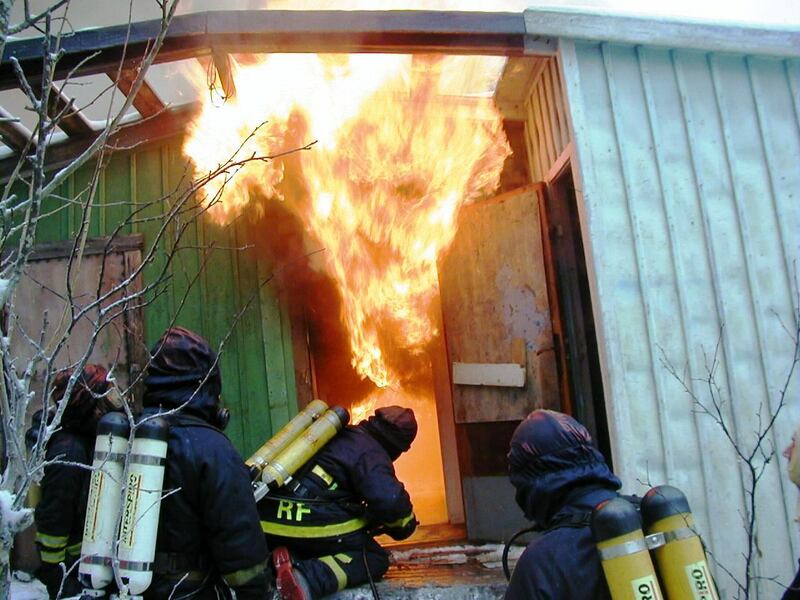 Contrary to fire fighting in the open, fire fighters attending a fire in a confined space like a room, not only focuses on applying water onto the burning surfaces (called 2D fire fighting) but on the entire volume of the structure that is threatened by fire, called 3D fire fighting. The objective is through selected equipment and tactics to take control of the interior conditions by applying a combinations of offensive and defensive extinguishing techniques. One of the differences is the attention to the possibility of rollovers (a.k.a. flameovers) where flammable gases in a room ignite, and of flashovers where most of the directly exposed combustible materials ignite due to heat emitted by the initial fire. In addition to extinguishing the initial fire, the purpose of 3D fire fighting is to minimize the oxygen available for the fire, avoid creation of hot gasses and cool down flammable materials close to the fire to avoid their ignition. A room fire will draw the needed air from the floor of the room. The hot gasses produced by the fire will move up towards the ceiling and will be pushed outwards by new hot gasses coming from the fire. Away from the combustion area, they will cool down and move towards the floor. When micro-drops are sprayed into the room, their low weight will give them a long hang time in the air, whereby they easily are dragged into the combustion area of the fire by the circulating airflow. The fire will use its energy to vaporize the water, draining it of energy, and thereby reducing the temperature of the fire. The vapour will displace the air around the fire, that has been feeding the fire with oxygen. The fire is hereby literally starved of the oxygen it needs to continue. The steam will create a buffer zone between the fire and the smoke, which improves visibility and makes conditions more bearable for trapped occupants and fire fighters. The water vapour will cool down the gasses surrounding the fire and reduce the surface temperature of un-ignited fuels inside the room, reducing the likelihood of an expansion of the fire. Micro-drops with long hang time. Micro-drops transported by the airflow into the combustion area. Micro-drops instantly absorb heat and generate steam. Steam pressure prevents oxygen feeding the fire - cooling hot combustion gases. A house in Kiruna, Sweden on fire. Oxygen is needed for a fire to ignite and keep burning.